The design is more obvious than my current fave grey lenses (Super Nudy Grey), and the contrast between my brown eye colour and the grey lens is slightly more obvious in bright lighting. But it's not a terrible thing since I don't mind a more obvious patterned lens - as long as the result is dolly. Quite comfortable, but on tired eyes they won't be comfortable. I'm a regular contacts wearer so I try to give 1-2 days off from wearing contacts per week. And if I don't my eyes feel really tired and dry. These lenses have a nice, large pupil hole so comfortable vision isn't compromised, However this will mean a more noticeable contrast against your natural eye colour. It shouldn't be too obvious in indoors lighting, but under bright light it may become obvious that coloured/patterned lenses are being worn. Design-wise I probably favour my Super Nudy greys more, I just think the intricate patterning is prettier on the eyes. 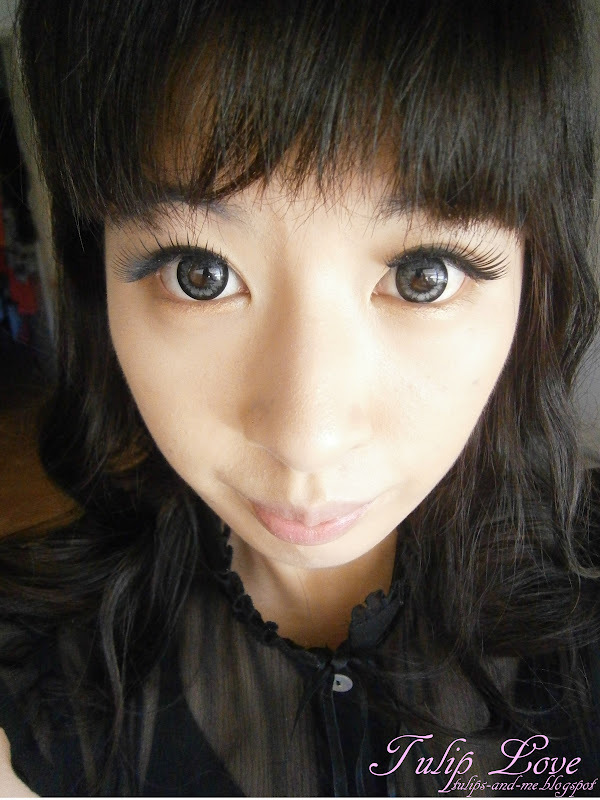 When I first started wearing circle lenses I thought my eyes would be too small for anything above 14mm. Now I don't want to wear anything below 14.5mm because they really do enlarge my smallish eyes. My eyes aren't smallish per se, but since my nose is big, and my cheeks wide they do appear small in contrast! But the diameter is sooo big. So great, I would actually also love to have some contact lensees which make my eyes look bigger but I am scared that they could be dangerous for my eyes. Where did you buy them? The safety of your eyes is quite important! I only wear circle lenses 2-3 days a week, for less than 6 hrs per time. I'm pretty sure they have this style in 14mm too! Looks lovely on you. I like grey lenses, too. Awwww you look so pretty! <3 I like grey lenses with black hair too! It just feels much more mysterious. Might try these out, but I always chicken out when it comes to lenses with bigger diameter! love the lenses :D looks so cute! Gambateruuu with shopping ban, I'm going for 1 May shopping ban :) go go go us! hey! <3 great that you want to be my friend! :) you have skype? You are beautiful! Also I would like to visit Japan and Korea. I thank you, you also have beautiful hair! So pretty!! I have never tried out 14.8mm lenses before worrying that it might make my eyes look too unnatural like this --> O.O but these looks great on you!! I was really nervous about trying bigger diameters too, but they don't feel that much different to 14mm to me! Thank you! Yeah, I was surprised that this photo came out so bright! Aww, too bad larger diameters are too drying for you! But health & comfort is more important than fashion! Thanks! I think 14.8 is a nice diameter compared to 14mm & 15mm. I guess I like playing with unnatural, dolly looking eyes so the diameter & pattern don't bother me, but yep wouldn't wear this look to some occasions/places. haha, thanks. It's fun to make fun of oneself every now and then! Hi I love the contrast with your natural colour! You look so pretty! My eyes are a green/grey do you think they would look odd? I had some before but they turned out to be too dark :( p.s your so pretty!